Listen to the sound of the Bell ! …. it first rang 31st May 1859. 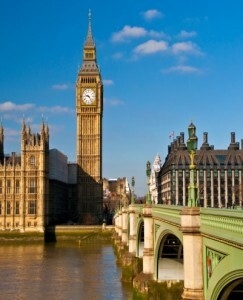 Why is it called Big Ben? Nobody knows the exact origin but probably the bell was named after Sir Benjamin Hall, who supervised the installation. His name is actually inscribed on the bell itself. The Big Ben tower is 315 feet high—making it the third tallest free standing clock tower in the world and it holds the largest four-faced chiming clock. The clock tower is actually tilted. Due to some tunnel excavation nearby, the tower now leans slightly towards the northwest by 8.66 inches. The leaning tower of London! Has it ever been wrong? In 1949, a flock of birds constantly pecking on the minute hand made it slow down by 4.5 minutes. O Lord, keep safe our Queen Victoria the First. Yes, Queen Victoria! One of the most famous British women in history.